Is This Motorola’s First Tegra 3 Quad-Core Phone with 2GB of RAM or Just a Render? Real or render? That’s the question on everyone’s mind this morning when referencing the picture above. The photo and spec list was apparently posted to Concept Phones at some point and then possibly spread across the globe quicker than Kate Upton on the Cover of SI’s swimsuit issue. The post from that site clearly calls this a render, but since it looks like an actual photo, people are running with it today as being legit. Can’t say that I’m ready to buy into it being real, but let’s still walk about what we are seeing. Called the “Atrix 3,” this device (in theory) would have an HD screen, 10MP shooter, 3300mAh battery, quad-core Tegra 3 processor and 2GB of RAM. As long as the bootloader is unlockable, this would be a dream phone, right? Except for a couple of things. Moto is using 13MP cameras in its high end devices now (that would be their HD phones in China), plus we are still not sure if they would be willing to jump back in with NVIDIA. As you all know, their experience with Tegra 2 last year had all sorts of drama. But, with NVIDIA producing the only working quad-core chip at this point, you have to at least consider that they could partner up one more time. So you guys decide if this thing is legit or just a dream. 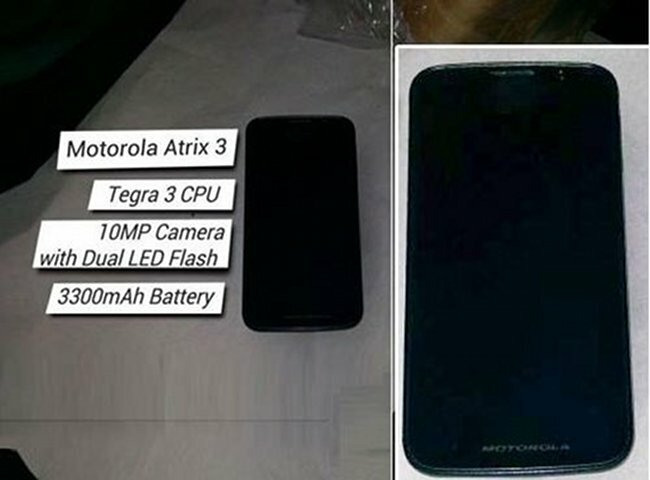 We first reported back in April of last year that Moto had two Tegra 3 concepts going, maybe this is one of them?